Painting walls can be a lot of fun that can help personalize any room in a home. Homeowners can choose to hire professional painters, or they can save a lot of money by doing the work themselves. But how does someone paint a room when they’ve never had experience with doing so before? 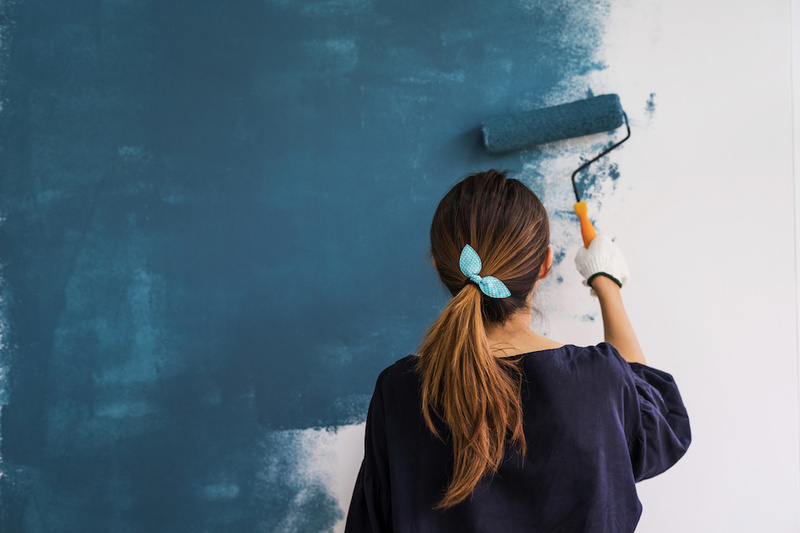 Here is a guide to painting rooms for new and veteran homeowners alike who want to learn the ins and outs of customizing their home (whether it's for themselves or to stage their home to sell). Painting isn’t just as simple as dipping a brush in a can of paint and going to town. First, homeowners need to make sure that they protect what’s in the room, and that means doing some prep work. The first thing homeowners should do is move all furniture out of the room in order to protect it from accidental spills, or in the case of larger furniture, move it toward the middle of the room so it isn’t close to the walls. Other things to do include laying out a tarp to protect the floors and removing vent covers and light switch plates. It still isn't time to paint quite yet. First, the homeowner needs to clean the walls because dirty, dusty walls can prevent the fresh paint from sticking well. Cleaning can be done with a moistened rag, and using a vacuum cleaner can help with removing things like spiderwebs from hard to reach corners. Once the walls are clean, the homeowner can begin laying down painter’s tape. Painter’s tape is similar to masking tape in that it’s easy to remove when its job is done, but unlike masking tape, it creates a tight seal that prevents paint from seeping beneath it, creating crisp lines when it’s pulled away. Homeowners can place this tape around molding and windowsills to keep them safe from paint. Before the homeowner can get into the meat of the painting, they need to first do what’s called cutting in. Cutting in is basically outlining the wall by using a brush. This creates an area to work within and helps prevent mistakes made with a roller brush by going too close to the edge. Once the wall has been cut in on all sides, the homeowner can finally move onto the rest of the painting. Using a roller brush is the best choice for the job as it will cover the most area the most easily and with the most even coat. However, when using a roller brush, it’s important to remember to use vertical strokes and not horizontal. This is because horizontal strokes have a tendency to drip downward and get missed, whereas any drips made from vertical strokes will be gone over with the roller to hide them. Some paints can get away with only having one coat, but in most cases, it will be necessary to use at least two. In order to make it easier to see if a coat looks patchy, try turning on lights and closely inspecting the wall. If any of the previous color peeks through the new color, it’s a telltale sign that a second coat is needed. By following these steps, any Little River homeowner can save some money by painting their own walls and also create a real sense of ownership regarding the home’s appearance. For more advice regarding different types of paint and supplies to use, be sure to consult a professional at a local hardware store where paint is sold.